Thick clouds, a fog bank, a sunset and the beauty of the mysterious islands surrounded by the fury of the Atlantic Ocean is what makes up the beauty of the scenery from the town of L'Anse aux Meadows in Newfoundland. From the town of L'Anse aux Meadows on the Great Northern Peninsula in Newfoundland, Canada, the scenery is beautiful as the sunset hues encompass the sky over the Atlantic Ocean. The sunlight filters through the clouds which thicken during the sunset hours while a fog bank lingers in front of the islands and blocks out their beauty. Along the coastal shores of this historic Viking town, L'Anse aux Meadows in Newfoundland, the rocks have been bared at low tide allowing the sunset lighting to glisten off their peaks. Once the fog bank settles in for the evening, the possibility of it lingering around until morning is very real. L'Anse aux Meadows is a unique town filled with amazing history of the Viking era and the rugged coastal scenery of the islands is picturesque at sunset. The coastal shores of Newfoundland at sunset are what makes it easier for a photographer to capture some amazing pictures. 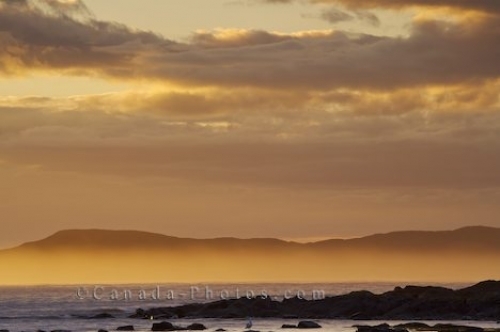 Picture of the fog highlighted at sunset in front of the islands in the Atlantic Ocean near L'Anse aux Meadows, Newfoundland. Islands with fog rolling in at sunset on the Atlantic Ocean seen from the town of L'Anse aux Meadows, Northern Peninsula, Great Northern Peninsula, Viking Trail, Trails to the Vikings, Newfoundland, Newfoundland Labrador, Canada.